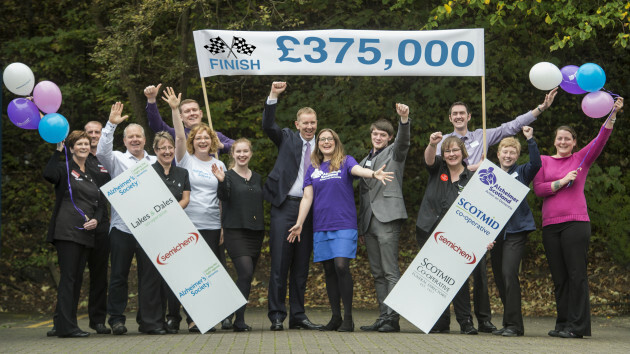 Scotmid Cooperative’s one year charity partnership with Alzheimer Scotland and Alzheimer’s Society has crossed the finish line having raised their highest ever total of £375,000 to help people living with dementia, their carers and families. The engagement, commitment and support from across Scotmid Co-operative’s staff and customers including Scotmid, Semichem, Lakes and Dales Co-operative and Scotmid Co-operative Funerals over the last year has been truly incredible. From cycling to Paris and trekking up mountains, to store raffles, sweepstakes and head shaves, staff and customers have consistently smashed targets and championed the cause. Thanks to their incredible efforts and generosity, this has been the most successful Scotmid Co-operative charity partnership to date, far exceeding the initial £250,000 target. All vital funds raised will help to fund specialist Dementia Advisors, as well as supporting a wide range of vital community initiatives such as Dementia Cafes, singing groups, allotments and reminiscence projects up and down the country. With this level of investment in these areas, the partnership will make a huge difference and achieve a real and lasting benefit for people living with dementia and their families. With over 90,000 people living with dementia in Scotland and the number set to double in a generation, the partnership between Scotmid Co-operative, Alzheimer Scotland and Alzheimer’s Society has also challenged perceptions about people living with dementia, as well as helping create a positive shopping environment for customers with dementia. In its aim to become ‘Dementia Friendly’, stores across the country hosted dementia awareness stands and a Memory Bus roadshow during Dementia Awareness Week, and more than 100 key staff across the business became accredited Dementia Friends. John Brodie, Chief Executive of Scotmid Co-operative said: “This is another record fundraising figure for our Society meaning that in the past three years Scotmid’s staff, members and customers has raised over £1m for our Charities of the Year. “Very quickly we found out that Alzheimer’s and Dementia touches so many lives and this struck a chord especially with our employees who embarked on a year of fundraising that helped raise an astonishing £375,000.